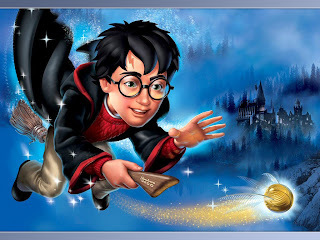 Ferdie's Funhouse: Happy Birthday Harry Potter! Along with Disneyland, July is also the home month to another important birth, that of my good friend Harry Potter! Harry, I just wanted to take this moment to tell you how grateful I am for your friendship these many years. It truly has been a delight knowing you and having you be such a large part of my life! I can't wait to see you, Ginny, James, Albus, and Lily at the BBQ on Saturday! Tell Ginny I'm bringing a salad and drinks, but let me know if you need anything else and I'll be happy to bring it! Happy birthday ol' pal! As wizard photographs have a harder time uploading on my computer, and people walk in and out of them all the time anyway, I just decided to post this fun little cartoon version of Harry instead of the photos from our last vacation together I was going to try and put on here. What about Severus? Poor chap is always forgotten. I've been checking out your blog every now and then, and thoght this was cute. My grandson's birthday was also July 31. I had forgotten that he shares a birthday with the famous Harry. Holly! Oh my dear Holly, how in the world are you doing? Hope things are going well.